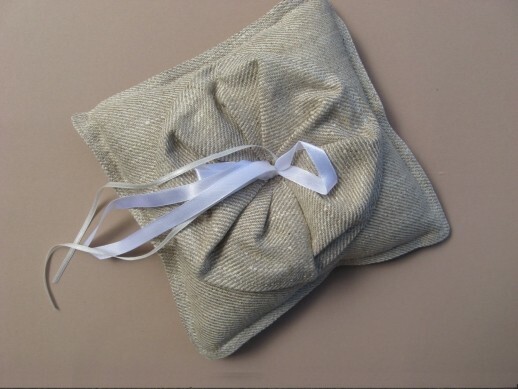 This rustic view ring bearer wedding pillow is handmade from 100% natural, organic linen fabric from Lithuania. The flower is made from same fabric as the pillow, by professional artisan, Rosita. It has a pink satin ribbon to tie the rings. The pillow measures 9" x 9". Note - There is not a tie on the back of this pillow. 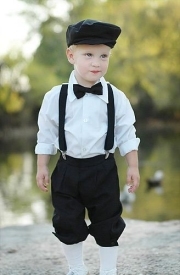 A wonderful choice if you are planning a vintage, country or just handmade style wedding. All details of this pillow are handmade by Rosita. 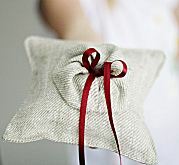 For more information on Rosita and her ring bearer pillows, please see the complete profile on her in our blog.